CITY OF INDUSTRY, CA--(Marketwire - October 21, 2010) - Newegg Inc., the largest pure-play technology focused retailer online, is proud to announce it has been recognized as the Microsoft® 2010 Launch Partner of the Year. Newegg's selection was based in large part on the company's extensive commitment to the launch of Windows 7 and Office 2010. Through a close partnership with Microsoft, Newegg engineered the creative and successful marketing program, "7 for 7," which attracted over 1 million web users each day. Winner and finalists for the Microsoft 2010 Launch Partner of the Year award were praised for exhibiting thought leadership, thorough planning and successful execution around the launches as well as the strength of their partnership with Microsoft. Newegg was recognized for its ability to promote the Microsoft solutions to a wide variety of consumers, enthusiasts, and business owners while empowering them to make educated buying decisions. Newegg's innovative "7 for 7" campaign, utilized a broad reaching array of platforms including social media, print, Internet radio, Webinars, a college campus tour, a sweepstakes and more to engage consumers in a dialogue about the much anticipated launch. "Newegg is a valuable partner who has exemplified the ability to provide great technology offerings to their customers," said Eddie O'Brien, vice president of Microsoft OEM. 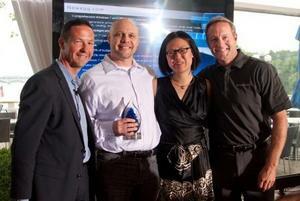 "We're happy to recognize them as the Windows 7 Launch Partner of the Year. Their unique offerings are a perfect fit for those looking for the latest in technology." Bernard Luthi, Newegg's vice president of marketing, web management and customer service, noted: "Newegg is honored to be named Microsoft's Launch Partner of the Year. We dedicate much energy in ensuring we provide our customers with a compelling online shopping experience -- from educating them about the features of Windows 7 for example, to fulfilling orders in a reliable and timely manner and providing superior customer care. We cannot, however, be truly successful without the support of our valued partners. Receiving this recognition from an industry giant like Microsoft is a true testament to the strong and close partnership we have established with some of the most prominent technology manufacturers worldwide. Furthermore, our ability to be an effective launch partner will enable us to continue to offer our customers selection and value." Newegg's selection was based in large part on the company's extensive commitment to the launch of Windows 7 and Office 2010. Through a close partnership with Microsoft, Newegg engineered the creative and successful marketing program, '7 for 7,' which attracted over 1 million web users each day.